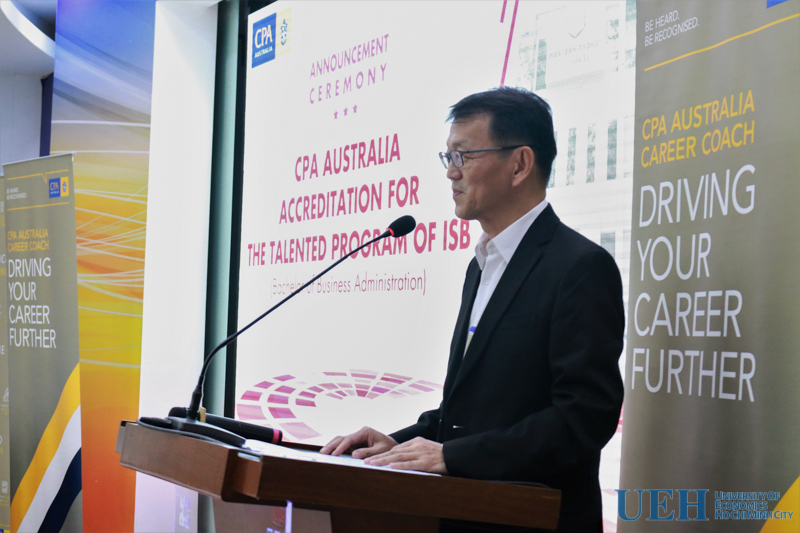 In early 2018, International School of Business (ISB) has been honored to receive an official accreditation by CPA Australia. CPA Australia (Certified Practising Accountant) is one of the largest and most respected professional accounting bodies in the world. 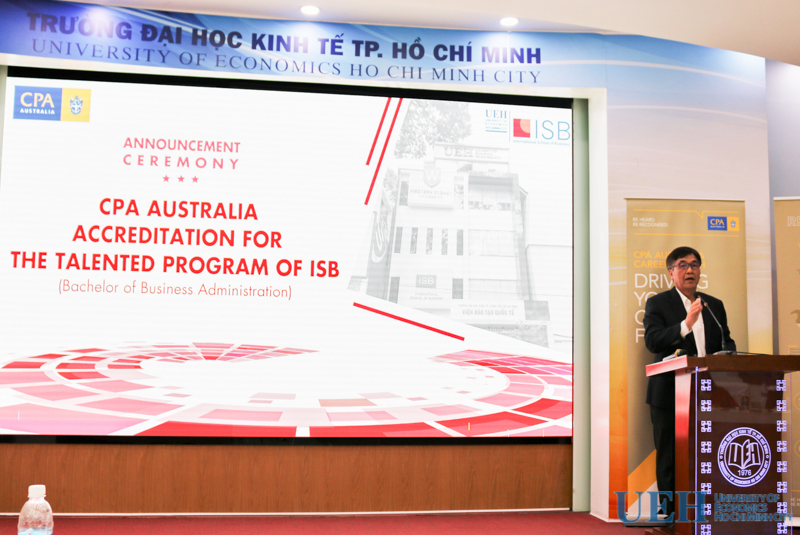 With the recognition of CPA Australia, the soon-to-be graduates of ISB’s Bachelor Talented Program would be eligible directly for Professional level consisting of 6 subjects (because of being granted for a full exemption of 6 Foundation Level subjects) when they undertake the CPA Program provided by CPA Australia. 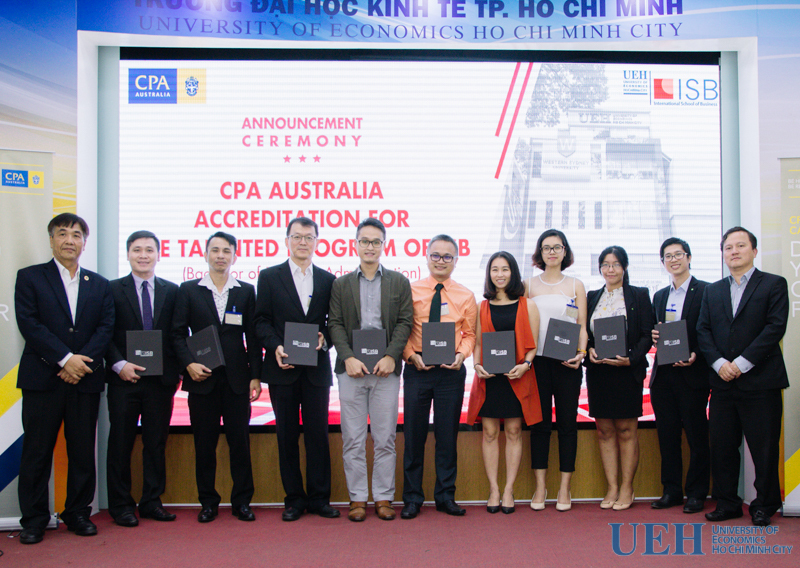 Up to date, only three programs of the leading universities in Vietnam, including BBA Program of UEH-ISB, have been accredited by CPA Australia. To the graduates in the majors of Finance, Accounting, and Auditing, etc., undertaking an internationally-recognized professional qualification program like the CPA Program and holding any global designations as CPA (Aust.) plays an important role in their career development pathway and success. With the global CPA (Aust.) designation for strategic business leaders, these graduates can create an advantage plus of applying for the first jobs in multi-national companies and getting job promotion with a higher pay in their career life. Therefore, the accreditation of CPA Australia is a milestone which clearly demonstrates tremendous improvements in ISB programs’ quality. 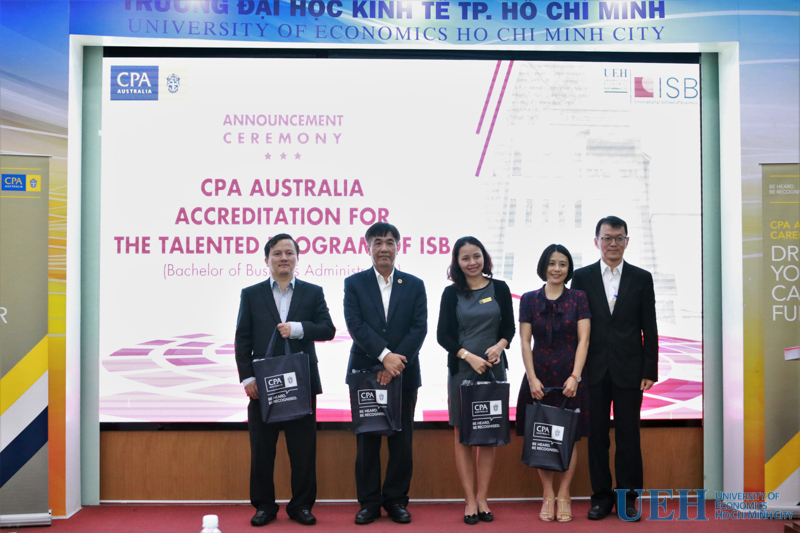 Alongside with it, the ISB’s soon-to-be graduates and students who are undertaking the Talented Program of ISB (the Accredited Program of CPA Australia) will have more competitive advantages in job searching and employability. 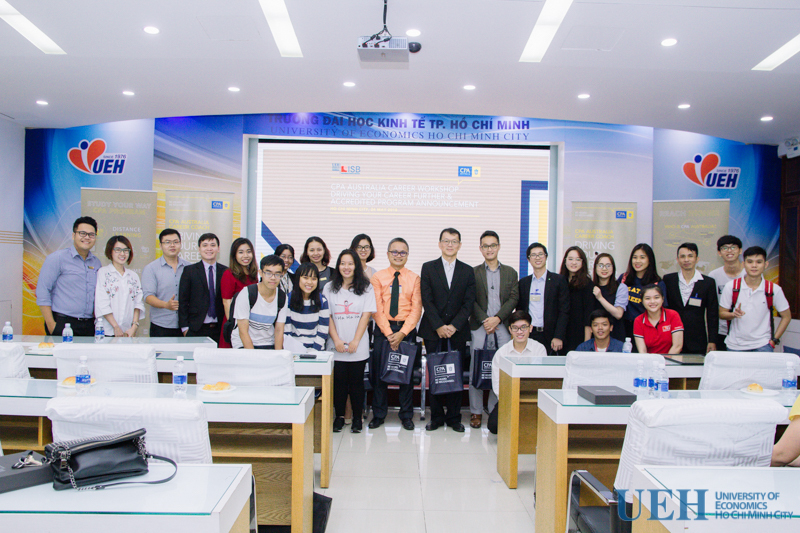 To remark it, on 24th May, 2018, at A.103 University Hall - UEH Campus A, 59C Nguyen Dinh Chieu Street, District 3, UEH-ISB and CPA Australia co-organized an accredited program Announcement Ceremony. Attending the ceremony, ISB was pleased to welcome the presence of delegates and special guests: Prof. Nguyen Trong Hoai, Vice President of UEH; Mr. Phan Nhu Minh, Vice Dean of ISB & Dean of the International Languages and Country Studies Institute (ILACS) along with the leaders of relating departments. On the CPA Australia's side, ISB was honored to welcome Mr. Ng Eng Wan FCPA (Aust. ), Entrepreneur & Vice Chairman of South Vietnam Advisory Committee; Mr. Lam Quang Tuan, Senior Business Development Manager and these honorable guests from partner corporations and the consulate general. UEH-ISB will continuously and sustainably develop and improve our programs in order to meet international standards in terms of education & training quality, and excellence of governance, facility management and student services and create a more professional, open-minded and friendly learning environment different from traditional environments in Vietnam. The representatives of CPA Australia giving a big thanks to the Boards of Management of UEH and ISB. The special guests attending the ceremony. Source: Department of Communication and Public Relations UEH, International School of Business (ISB).